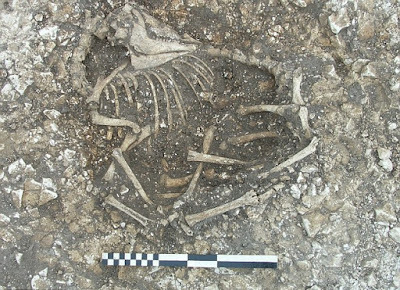 Archaeologists have unearthed numerous hybrid animals from a site dubbed Duropolis near Winterborne Kingston in Dorset, which were carefully created by the ancient people over 2,000 years ago and buried in store pits beneath their houses. The ‘monsters’ include sheep with an extra head and a cow with a horse’s head, which were probably made to placate the gods. 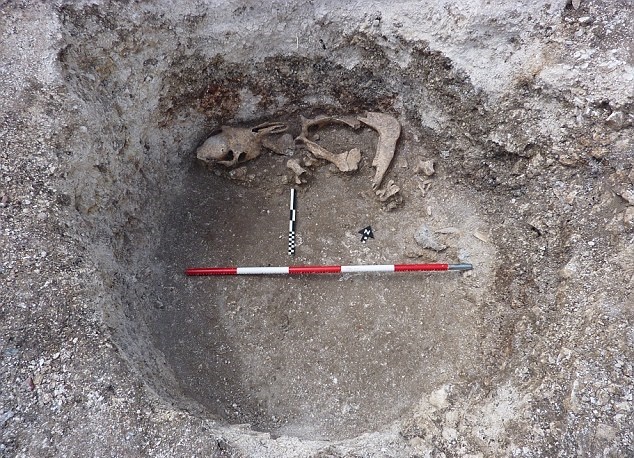 Miles Russell, co-director of the Big Dig, told MailOnline that the animal parts were carefully placed in storage pits between seven and 10 ft (two and three metres) deep that were usually used for storing grain and other important supplies beneath the entrance of houses. ‘Such practices have been hinted at elsewhere in the UK but not at this intensity,’ he said. The hybrids include cow with a horse’s legs, a sheep with a bull’s head placed at its rear end and a horse with a cow’s horn protruding from its forehead, The Independent reported. While the bodies of pigs, dogs and sheep were generally left intact with extra parts added, those of horses and cows tend to be more mixed up. For example, the team has found two examples of a horse’s lower jaw bone added to a jawless cow’s skull. Dr Russell explained that the people would have sacrificed valuable animals and butchered them, placing chunks of their bodies and limbs next to each other in the pits to create the hybrids ‘presumably as some kind of offering’. ‘In our minds, it’s bizarre and wasteful food-wise,’ he said, but demonstrates the importance of the ritual. 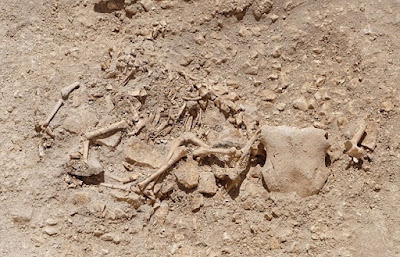 It’s not known whether the animals were stitched together or not, because organic material such as string would not survive in the ground for over 2,000 years. 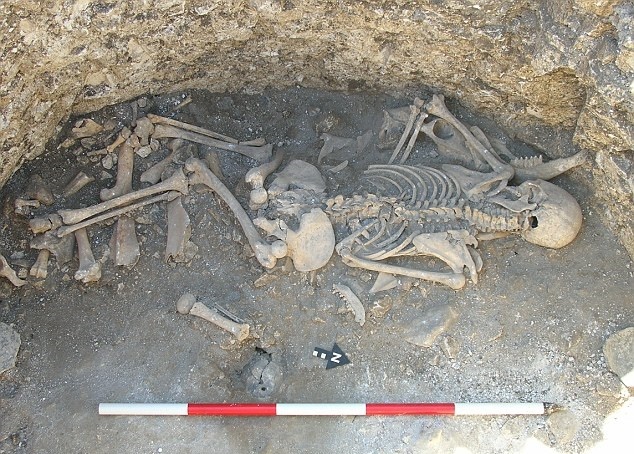 In one particularly unusual pit, archaeologists found a female skeleton bearing marks suggesting she was sacrificed. 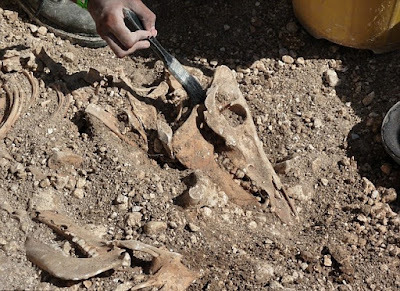 She was buried on a bed of animals including cattle, sheep, a dog and a horse, which had been arranged to mirror her own position so that her head rested on theirs, for example. Examples of Celtic human sacrifices are rare and there is no written documentary evidence from the people, but the Roman complained of the practice then they first invaded Britain. Because so many examples have been found, it’s possible the offerings were an annual event, he explained, to ensure a good or better harvest the following year. Relatively little is known about the religious beliefs of this period and the collection of discoveries goes some way to filling in gaps. ‘To find leftover religious practice is extremely rare,’ and evidence of a human sacrifice suggests there may be some truth in Roman reports, Dr Russell explained. 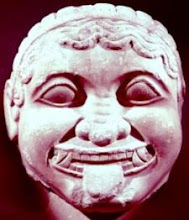 It’s also possible that evidence of hybrid creatures means that like other ancient civilisations, the Celts had myths of monstrous animals too. But the experimental horse/cow hybrids may suggest the Celts had a horse/cow god, he added. 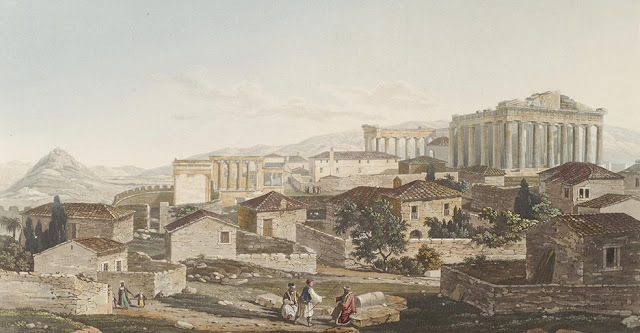 Based on the evidence unearthed so far and a geophysical survey, the team of archaeologists believe the settlement was made up of between 150 and 200 round houses and that the town flourished from 100 BC to 10BC. The township is one of the largest ever discovered in Britain. It’s thought the inhabitants were members of an early version of ancient Dorset’s Durotriges tribe. 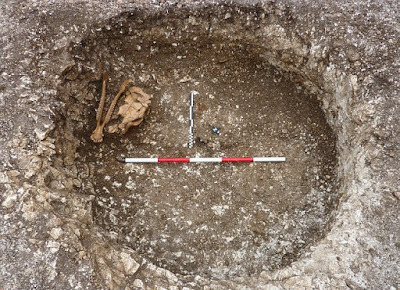 As well as the macabre pits and 16 Iron Age round houses, the experts also found evidence of an Iron Age metalworks and pottery. Dr Russell said: ‘We’ve exposed remains of 16 roundhouses in the two trenches we’ve dug. ‘They are pre-Roman house structures, the last that inhabitants would have been living in before the Romans arrived. We know that there are around 200 of these across this area, so we’ve got ourselves a prehistoric town or proto-urban settlement. 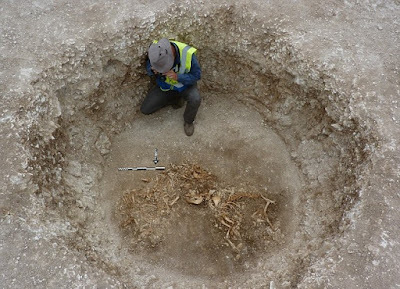 ‘What we’ve discovered is extremely significant for the whole of Southern Britain because in the past archaeologists have tended to look at really obvious sites, like the big hill-fort of Maiden Castle, near Dorchester. ‘What we have here is an extensive open settlement, not a hill fort, so it wasn’t visible as a settlement from the earthwork on the landscape. Paul Cheetham, a co-director on the dig, added: ‘What this suggests is that there are other big centres of occupation before the Roman arrival, this is a big open settlement, probably one of the first that the Romans encountered when they arrived. What a strange and time consuming thing to do!